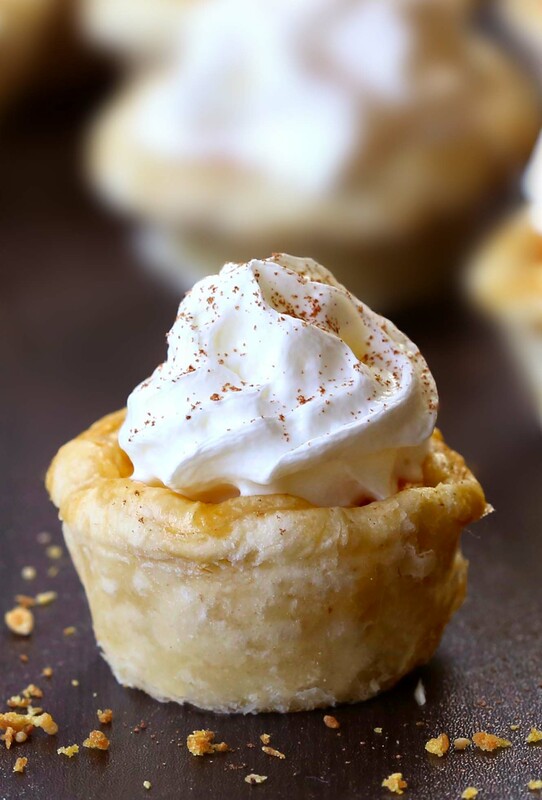 All the flavors of Homemade Pumpkin Pie packed into perfect portable fall dessert – Easy Pumpkin Pie Bites…. One of the reasons why I love the fall is because Miss Pumpkin steps on the pedestal again. I prepare it very often in this period, in various forms – pieces of pumpkin with crust baked in the oven, cooked in a soup, as well as the recipes you’ve probably already tried on my blog – Gingersnap Pumpkin Pie Bites, Pumpkin Dessert Delight, Pumpkin Bars with Cream Cheese and Pumpkin Muffins with Cream Cheese. Some time ago, my mom served us these sweet morsels, and since then this sweet delicacy has primacy over fall selection of desserts. 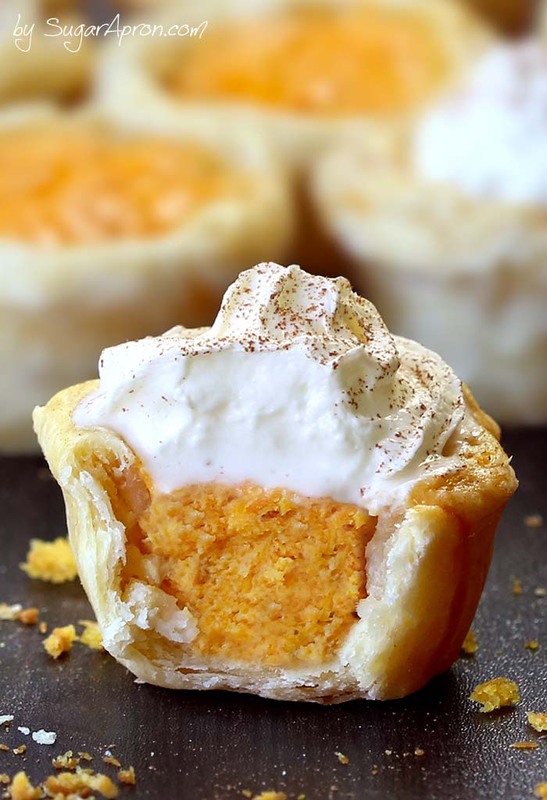 If you love pumpkin pie and are tired of waiting until Thanksgiving these pumpkin pie bites are the perfect way to get your fix, but they’re also great to pack up and give as a Thanksgiving take-home gifts. 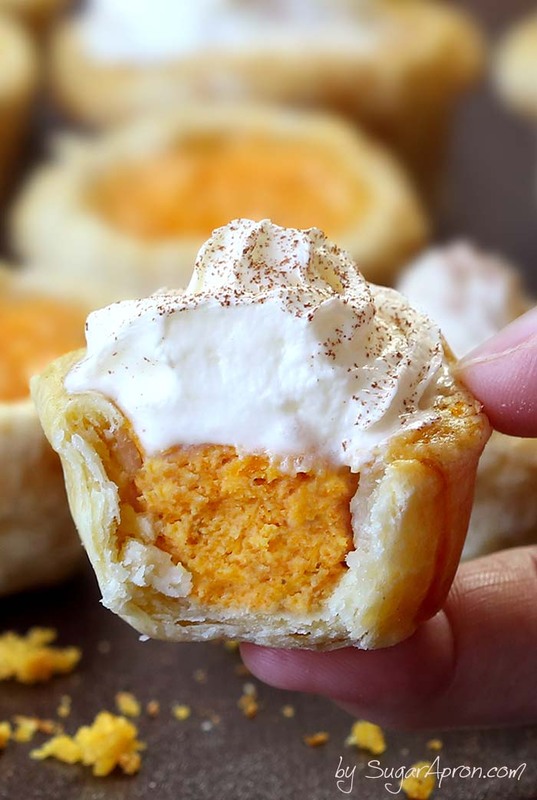 Make up a batch of these easy pumpkin pie bites and take them into the office or potluck. Then just sit back and watch how fast they disappear. Carefully press each round into the mini-muffin pan. Use your fingers to round the ends into a pie crust. Brush egg wash from one egg to the top edges of each pie. Using an electric mixer, beat the cream cheese and sugar until smooth. Add eggs one at a time, beating each until combined. Add pumpkin puree and beat to combine. Stir in vanilla and pumpkin pie spice. Spoon mixture into each mini pie crust almost up to the top. Bake for 15-20 minutes or until golden around the edges. Remove from oven and let cool on a cooling rack, or chill in the fridge for 30 minutes. Top with whipped cream and sprinkle with more pumpkin pie spice or cinnamon on top and before serving. Keep refrigerated. * Pies will be puffy when they come out of the oven, but will sink back down when cooled. I love how bite sized these pies are! That’s so fun! Great idea for children’s Thanksgiving and of course adults. I will make these for then. Thank you. My coworker made these yesterday and brought them to work this morning! These things are so good!!! I’m going to make some real soon! These are so adorable and YUMMY! We found the recipe on Pinterest and made them over the weekend. They disappeared fast! Thanks for sharing!! These are yummy & the filling is the BEST pumpkin filling I think i have ever had!! I only had a 2.5 cutter not a 3 & it worked but would have been better & prettier with the 3 just a note. I tried these with sweet potatoes instead of pumpkin, I used cinnamon and a dash of nutmeg in place of the pumpkin spice. Just a different variation for those who don’t like the taste of pumpkin. This looks amazing! What a yummy one to bring to a fall get together!